Camera clubs, Kodak Clubs, Amateur Photography Clubs, and groups with similar names began forming in Georgia by 1881. Some of these lasted into the mid-20th century, several died out and were never revived, some died and were reborn more than once, but the club activities and the contagious excitement of these camera “shooters,” always made the news locally, sometimes regionally, and at times nationally. The New York Society of Amateur Photographers formed about 1884, and they held their first annual exhibition in 1885. A “prominent New York photographer” quoted in the Waycross [GA] Headlight on August 11, 1886, bemoaned the price drop in finished photographic prints. Pictures are taken for a Song now. — What has brought down prices? Merely great competition, combined with the amateur photography craze. Then too, the clubbing system has had some effect in reducing prices to a minimum. With the introduction of the instantaneous process, it is much easier to take a good natural-looking picture, even by men who know no more about art than a pig; hence the increase in so-called artists. There were, of course, members of these camera clubs who made photographs for payment, and a few members of some of these Georgia clubs were active professional photographers. The development of regional photography organizations in particular, primarily composed of professional photographers and stock company representatives, is related to the growth of the amateur photographer and these “clubs.” In my opinion, the professional photographers believed they needed to make sure the public knew that they were professionals, and they could make a much better photograph for you in their studio than could Uncle Joe at home with his Kodak camera. They organized to familiarize themselves with new technologies and formats, and make their businesses flourish. This topic of one groups’ influence upon the other, on the local level, deserves closer examination. So where in Georgia were these camera clubs formed? The city of Atlanta and its metro area, including Agnes Scott College, which was Agnes Scott Institute until 1906, was by far the most active. Clubs were also started in in the cities of Savannah, Macon, Columbus, Augusta, and Athens, including those at the University of Georgia. The amateur photographers in other Georgia cities were active, certainly in both Americus and Thomasville, although I do not yet know of any formal club established in those cities. In this first of my two posts on Georgia Camera Clubs I’ll talk about those I know of in cities outside Atlanta. In my Part 2 post, I will discuss the formation of the various Atlanta area clubs, the women club members and amateurs, and briefly cover the literature (journals and magazines, books, and articles) available to Georgia amateur photographers. Rather than list these cities alphabetically, I instead list them by date of club formation or activity. 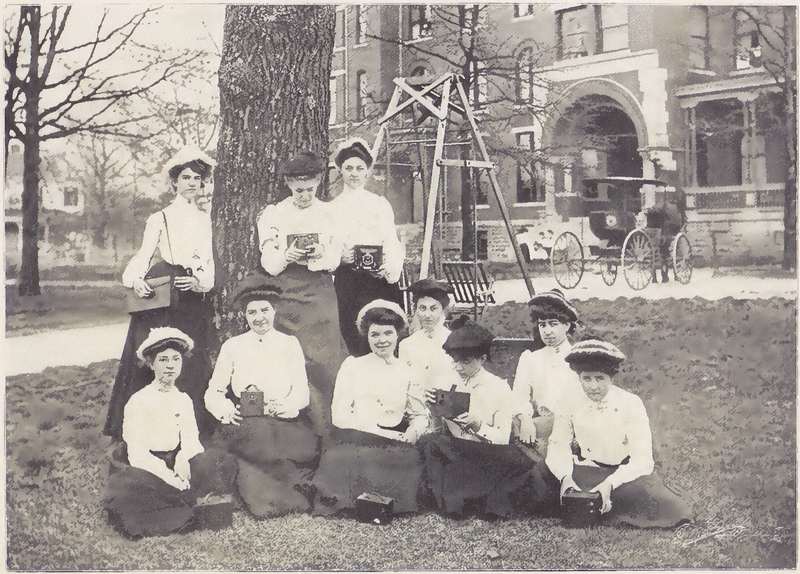 Athens: The University of Georgia had a Photograph Society by 1886, and members are listed in the 1886 Pandora http://tinyurl.com/kx4asnl . Another club was formed there a decade later, with both faculty and students participating. This event was noted in the March 6, 1896 Atlanta Constitution (p.3), and Professor A.H. Patterson was elected president. The Club will make excursions to places of historical interest around Athens, taking many photographs. At present the members — are taking pictures to be entered for a prize. By April 1, the Constitution (p. 4) noted that this University Camera Club now had twenty-six members, and they had secured two rooms, one as a developing and darkroom, and one as a reception room. Every member — has a camera and hundreds of pictures are turned out weekly. The club is in a prosperous condition. In the October 30, 1897 The Red & Black (p. 6) it was mentioned that a Camera Club had been formed “two years ago,” but it did not succeed. Students with cameras were urged to attend an upcoming meeting to help “perfect the [new] organization.” I do not know if this planned 1897 club actually came to be, but by 1900, an Athens Camera Club had formed and in July was offering prizes for best amateur pictures by club members. This Athens club had an upcoming photo trip planned to Tallahassee Shoals (July 27, 1900 Atlanta Constitution p.3). Thomasville: There was some activity among the amateur photographers of Thomasville in the late 1880s, but I do not know if a Club was ever formed. A boarding house fire in March 1888 was described by the Thomasville Times (March 3, page 1) in detail with the rather redundant subheading “An amateur photographer photographs the burning building.” The photographer is finally mentioned toward the end of the article. A brave little lady, an amateur photographer, happened to be out — when all was excitement and hurry, adjusted her camera near the burning building, and got an excellent picture of the leaping flames, black volumes of smoke and the crowd. In 1889, a Thomasville man named Clarence M. Dickerson won the second prize for best amateur “group photograph” taken with the Harvard Photo Outfit. His award was a 4 x 5 outfit sent to him from the Perry Mason & Co. of Boston (Thomasville Daily Times-Enterprise, Nov. 1, 1889 page 3). In 1895 there was a movement to establish a Camera Club at the YMCA. The Columbus photographer Constantine “de George” (usually DeGeorge; ca. 1837 – 1924) was going to instruct. They were to meet twice a week and would have all the necessary “equipment for amateur work.” Apparently the club was not a success, possibly for lack of interest, or because it met too often, or maybe Mr. de George, a hard-working professional photographer, did not have the time to devote to it. 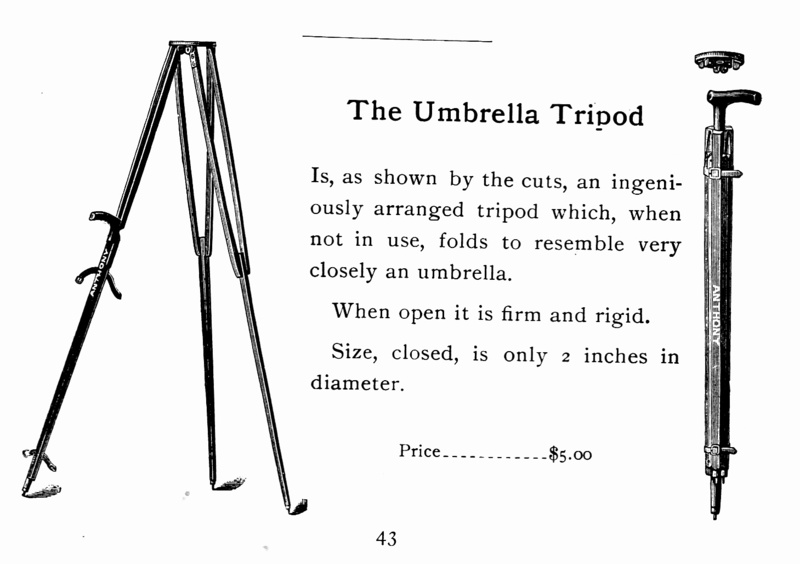 — we may as well accept the camera, together with the umbrella, as regular features in all pictures of assembled humanity. 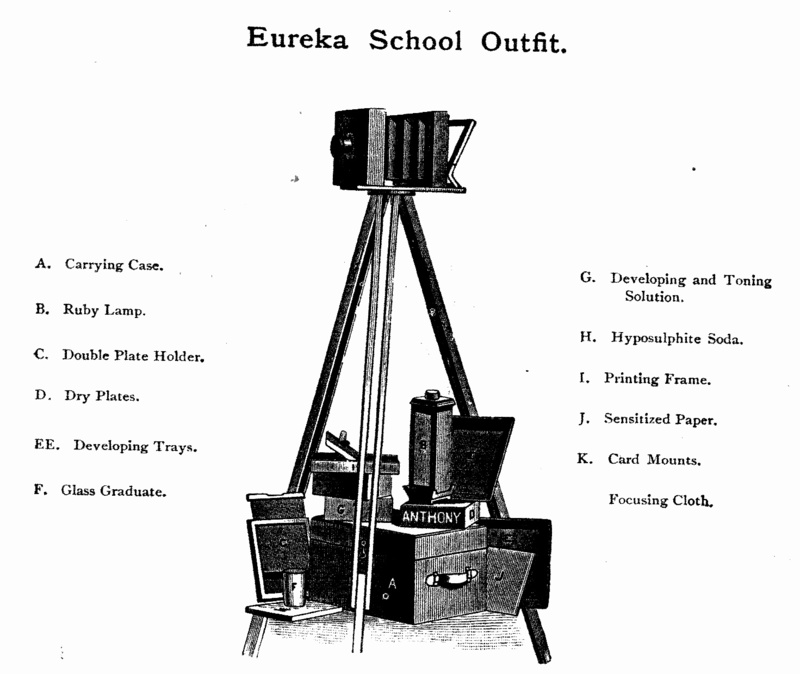 Had the author seen the January 1891 Anthony’s photo equipment catalog? will send the picture to New York as a typical Georgia scene, and it is not at all improbable that it will be many times reproduced on canvas by admiring artists who have an eye for the truly beautiful. In 1899 the Macon Camera Club became a reality. The movement to form it began in March when a meeting was held to which “all camera lovers and snap shot artists” were invited. Before the end of April, regular meetings were being held and they became semi-monthly by November. In January 1900 their meeting was held at T.P. Marshall’s drug store. (Macon Telegraph March 26, 1899 p.14, April 26, 1899 p.5, and Nov. 22, 1899 p.3; Jan. 31, 1900 p.6). The Chamber of Commerce offers attractive prizes for the best Kodak pictures of scenes in Macon and vicinity. Only amateurs are eligible to compete for special premiums. The professionals were only able to enter a professional class and compete for ribbons. William H. C. Dudley, Jr. (1872 – 1954) was raised in Americus. He was quite the “wheelman” and he began selling bicycles in 1895. The black and white drawings he used to illustrate his advertisements, initially for “Will Dudley, Bicycles and Bicycle Sundries,” are wonderful (did he do them, I wonder?). 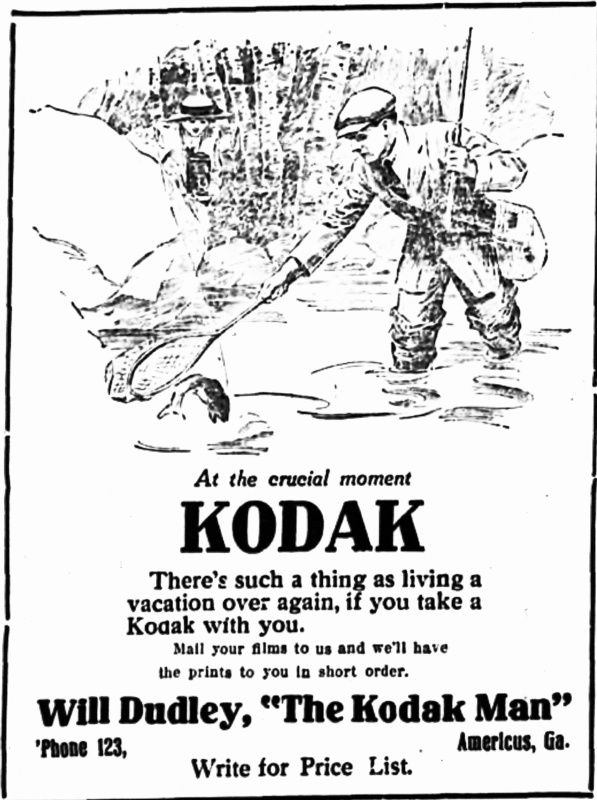 In July 1898 he advertised both bicycles and Kodaks, saying that “June Warmth – Has set people to talking vacation, bicycles and kodaks.” By November 1899 he was advertising the Kodak camera and his picture of a person’s hands holding a camera (a take on the Kodak advertisement) was run upside down in the first advertisement (Nov. 28, 1899 p.4), but was correct in later issues. From 1903 to 1921, William “Will” Dudley, Jr. of Americus, Georgia, was granted three patents for camera-related equipment. He held patents for a Developing Tray (1903), a Kinetoscope-Shutter (1911), and a Stereopticon Device (1921). All of these, including the drawings, can be found via a Google Patents search. Savannah: The Society of Amateur Photographers of Savannah organized in early 1892 and the news was carried by Anthony’s Photographic Bulletin in their February issue (vol. 23, p. 100). They elected as president J. A. Bates and as their vice-president, Dr. S. A. White. A secretary and a treasurer were also elected. In their April issue, the Bulletin spread the news that the Savannah group had established a headquarters, and “commenced their work with an exhibition of slides” (vol. 23, p. 196). Although they actually formed a month earlier, the date of organization given in the 1895 Savannah city directory is March 1892. The Society had the same officers in 1895 as they began with, except that the treasurer, who had been E.M. Hopkins, and was now J. deB. Kops. The Society of Amateur Photographers of Savannah existed through 1896, and by about 1897, the Society was superseded by the Savannah Camera Club. is in charge of the enterprise which will be under the auspices of the Savannah Camera Club. The chief interest is in the photographic observations which will be made with cameras on equatorial telescopic mountings, and also on stationary mountings, aided by the telescope. It will require a corps of eight or ten observers to successfully make the observations. 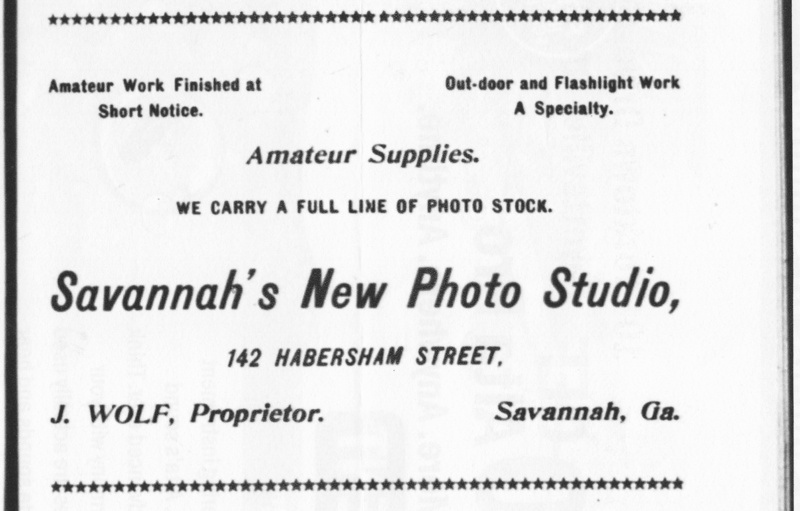 The 1900 Savannah city directory listed the Savannah Camera Club’s address as 1 Park Avenue, east, and its organization date as 1897, with an incorporation date of 1899. They had 75 members, met on Wednesday nights, and had a president, B. [Ben] J. Apple, and a secretary-treasurer, C.E. Yong (the former Society’s vice-president). In December 1901, Mr. Adolph Jerger, “a former Thomasville boy,” living in Savannah, won a medal from the Savannah Camera Club, and “a large number of prizes.” (Thomasville Times Enterprise Dec. 7, 1901 p.2). In 1901 Apple was still president (again in 1905) and there was a new secretary and a separate treasurer. In 1902 Barron Carter was president, but the office went to O.L Thompson in 1903, to E.M. Nichols in 1904, and to J. De B. Kops in 1907 and 1908. By 1909 the Club was no longer listed in the city directories and may have disbanded. Augusta: In January 1899, the members of the YMCA who were “camera enthusiasts” were invited to organize and form the first camera club in Augusta. Twenty member had already expressed an interest and they wanted to build “a darkroom, with a locker room adjoining,” purchase cameras at a reduced price, take outings, and later learn about lantern slides “as related to photography.” All members had to also be members of the YMCA. (Augusta Chronicle January 29, 1899 p.5). The YMCA club supposedly lasted several months. The following year, in January 1900, an article appeared under the headline “The Augusta Camera Club – a Promising Organization of Devotees to Photographic Art” in the Augusta Chronicle ( January 13, 1900 p.5). It was about a man, a Dr. Oertel, who had been a member of the New York Camera Club and on a recent visit back to that city, he decided Augusta should have one. The realization that Augusta, while it undoubtedly has many with artistic talent, is lacking, generally speaking, in appreciation of works of art, was emphasized and each one approached saw the benefit to be derived from a union [camera club formation]. A meeting was held some weeks ago and a definite scheme of organization adopted. Members would be over 18, either active ($2.50 – $1.00 per month), non-resident, or honorary, and ladies would be welcome and would pay the lower, non-resident fee for dues. It is the intention of the club to join the International Lantern Slide Association, by which there will be secured each month 100 slides from cities all over the world. These will be exhibited and —- a pleasant evening spent. There was to be a formal opening at rooms being prepared in the King building, with an office, developing rooms, and a room for bromide enlargements. The officers and members are listed, and president was W. Ed Platt. Mr. Platt was a local undertaker, but also a photography enthusiast who managed, from 1904 to 1910, the Augusta Photo Supply Co. at 466 Eighth St. His photograph, “The Old Fishing Hole” appeared in the June 1903 issue of Art & Photography. Dr. T.E. Oertel, who got the club going, was made vice president and the companion on his aforementioned trip to New York, Dr. W. C. Lyle, was made secretary. The membership list of the Augusta Camera Club, given at the end of this article, cites three wives, Mrs. Platt, Mrs. Lyle, and Mrs. Oertel. The list also includes R. H. Murphey [sic], C. S. Christian, Harry Hall, and a gentleman listed as F. P. Farrell, who is probably F. P. Farrar. All these Augusta gents were already involved, or would soon become involved in photography on more than an amateur level. Harry C. Hall, Jr. (1847 – 1907) was at that time the proprietor of the Augusta Photo Co. He began working in Augusta about 1888, and from June 1888 until 1892 he was partner to E. B. Peddinghaus in the Augusta Art Gallery, a photography studio. After Peddinghaus left, Hall continued in business until his death in 1907. R [Raymond] H. Murphy (1870 – 1937) was at that time a clerk at A. F. Pendleton’s, a company selling stationery, Kodak cameras, and photo supplies. He later was partner to F. P. Farrar. Fred P [Parker] Farrar (1883 – 1981) became R. H. Murphy’s partner in 1908 in Murphy & Farrar Co., which lasted eight years. 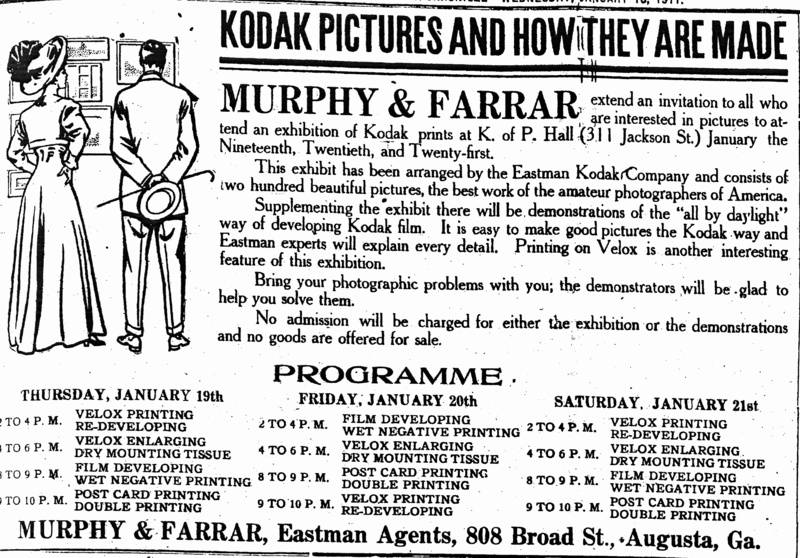 By 1917, and until 1920, he ran Farrar’s Inc. at 720 Broad Street and sold supplies, film, Kodaks, and postcards, as well as making panoramas. Farrar’s wife, Marie (b. ca. 1877), managed Parker’s Photo Palace at 808 Broad Street in 1907, then went to work for Murphy & Farrar, later Farrar’s. designed to meet the requirements of the amateur who has a camera, and who wishes to learn to make photographs in the best and cheapest way, and for those who are contemplating purchasing a camera or care to learn something of the elements of and processes in photography. There was to be a series of lectures on the camera, light and lenses, toning and finishing, etc. which the Chronicle editor thought the Club should investigate. He suggested they find out if these lectures would be published and “might be secured for the benefit of their members.” (Augusta Chronicle Feb. 23, 1900 p.5 and April 13, 1900 p.4). In 1904 the YMCA directors had a meeting to discuss forming a camera club. Two members were to set up a darkroom “and get other paraphernalia necessary to the club.” Mention was made of the former club, which “broke up for lack of interest.” The Y had a new building so they thought this was the proper time to have a new camera club. (Augusta Chronicle July 9, 1904 p.10). Two of those officers were connected to the photograph industry in Augusta. In addition to Murphy, the man the newspaper called ” L. L. Higginson” is actually Luther L. Higgason (b. 1885) who had The Higgason Studio, on Broad St.. He had run the studio since sometime in 1908, and it lasted at least two more years. I do not know how long this particular Club lasted. 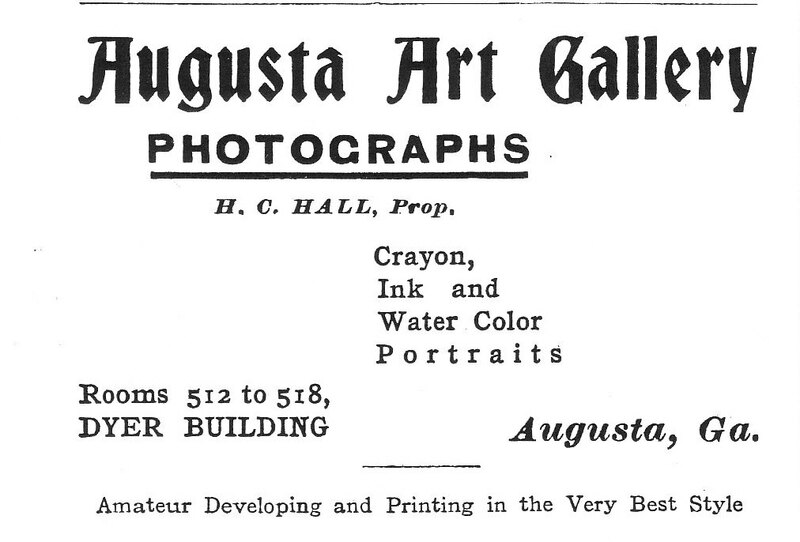 Amateur photographers are mentioned in later Augusta newspaper accounts, but as far as I can tell, there is no official camera club after 1909. An expensive camera for a child is unnecessary and unwise. — when a more intimate knowledge of photography has been gained, a better one can be procured. A serviceable camera costs no more than a first-class air rifle. —-The strongest argument I can offer in favor of the camera for children is that it cultivates close observation and investigation to a high degree. A child armed with a camera will be constantly on the lookout for material and and will discover things which otherwise would not attract his notice. 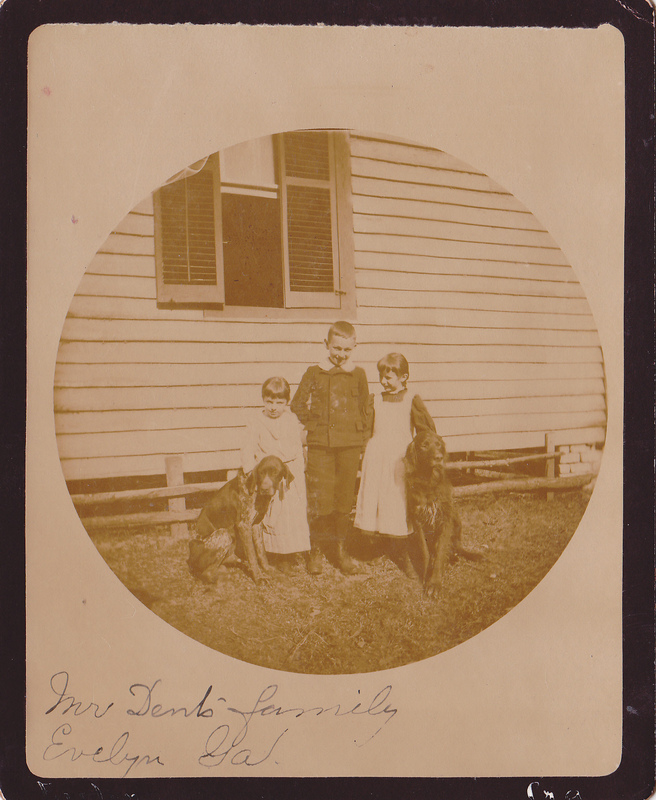 Your caption states that the Mr. Dent’s Family photo was a Kodak 1 or 2 — the first Kodak produced 2.5 inch diameter pictures, while the #2 took 3.5 inch images. The image looks like it was from the #2. Good point! I will make that change after I measure that image to double check and verify. Thank you so much for reading.